Pineapple is one of those exotic fruits you may be craving when the weather gets warmer. Juicy and fresh, they’re great for so many summer dishes, from cocktails to salads and barbecues (try glazed barbecued pineapple! ), to plain slices or cubes to nibble on in the sunshine. But they do require a specific technique for cutting. Here are our tips for safe and easy pineapple carving. The first technique is for those who want to get straight to the point with their exotic fruit. It consists of grossly getting rid of all the non-edible pieces of the pineapple. To do this, grab a long and sharp knife with teeth (like a bread knife). Take of the hat (the top) and the bottom of the pineapple. Then cut the fruit in four quarters (height wise). To remove the hard white bit in the centre, slash the quarter on each side, then slip the knife under the white bit between the two slashes. Repeat on each quarter. To retrieve the good parts, without the skin, one last step: checker your pineapple quarter to draw cubes. In the same way as for the white bit, slash each quarter and slip you knife between the flesh and the skin. The second technique for cutting a pineapple consists of quickly getting rid of the peel in order to preserve only the flesh. Repeat the first step of the previous technique by cutting the top and bottom with a toothed knife. Then cut the skin by turning around the pineapple. This step is more delicate. You need to be precise in order to cut out the “eyes” (the little dents) without taking off all the flesh. 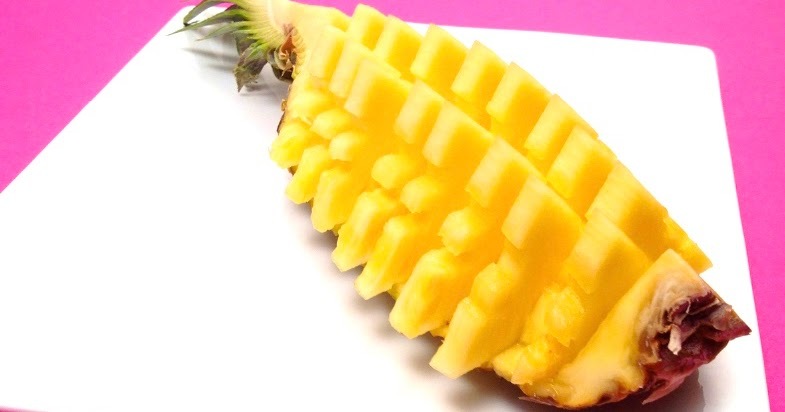 Once the pineapple is “naked”, cut it in big slices width wise. With a small cookie cutter or similar, take out the heart (the white bit in the centre on each slice). You can then decide to keep the fruit in slices or cut in in pieces. Same as the watermelon, pumpkin or squash, pineapple is among those fruits and vegetables much appreciated by creators of edible decors in palaces, big restaurants, etc. Some can create wonderful objects with one or a few pineapples. Fairly enough, we are more in the world of sculpture than of cuisine! The techniques needed to achieve these kinds of feats are actually too complex to prescribe right here, but are worth looking up if you are trying to impress your friends and family for a big gathering, or if you have too much time on your hands.